If you want roofing in Lucas, TX for an affordable price, do you know who to contact? ECO Commercial Roofing can assist you with each of your roofing service needs, so shoot us a call at (833) 200-0571. Customer satisfaction is a primary objective of ours, and we can supply you with almost any kind of roofing assistance you may need. We’ve been commercial and home roof contractors in the Lucas area for years, and our contractors are proud members of our community. Our contractors are extremely knowledgeable on the various kinds of roofing, and we’re glad to assist you with any of your roof questions or concerns. Anytime you’re searching for a smarter roof experience, call the professionals at ECO Commercial Roofing for help. Your roof plays a significant part in defending your house, so it is of the greatest importance that you have a roofer you can trust. We ensure that each of our roofers are taught to the industry standards, and we only purchase materials from contractors we can trust, like Conklin. We additionally supply a wide array of roof options for you to choose from, as your roof can have a significant impact on property value. As far as benefits, be sure to consider the resiliency and the benefits with the same scrutiny that you choose the style. The type of roofing you choose will ultimately depend on your budget, and the kind of building you are needing to protect. Luckily, our team can give you tons of options. Reliable roof services are our primary objective, and we can deliver that in the form of repairs, replacements, and installations too. Our professional services are available for business, residential, and industrial projects alike. Typically catered towards flat roofs or low slope roofs, our commercial services are the preferred choice for most business owners. Ponding and leaking are both common with flat roofs, but an expert installation is the initial step in entirely avoiding problems such as those. Industrial roofing is similar to commercial roofing, but such roofs require specialized installation, as well as specific material requirements if you expect them to last long. For homeowners, we also offer a selection of cost-effective residential roof styles that are sure to fit your needs! As contractors that specialize in roofing restoration, we understand more than a few techniques to work with roof coatings. In our experience, using top quality materials like Conklin can truly make the difference between the roof coating that lasts, and one that doesn’t. In order to provide superior roofing in Lucas, TX, our crew works hard to deliver incomparable customer satisfaction, with the assistance of devoted craftsmanship and experience. To learn more about our Conklin roof coatings, or to ask questions about our roof restoration techniques, give us a call at (833) 200-0571! When your roof is approaching the end of its lifespan, you can typically choose to replace it or to restore it, and we often recommend restoration. Correctly done, one of our Conklin roofing restorations can provide an extra 10 years to the lifespan of your roof! Save yourself time and cash by choosing a reliable roof restoration in place of a roof replacement. The bulk of our roof restorations are finished using Conklin’s top quality roof coating products. Available in a selection of types and purposes, you can depend on our contractors to help you decide which option will work best for you. Various coatings provide varying levels of adhesion, flexibility, and moisture resistance. 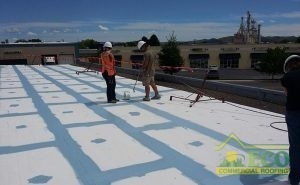 Thanks to the special design, your roof coating will probably be applied right over the existing roof system. To discover more, call our team now at (833) 200-0571! Acrylic Roofing Changing temperatures cause your building’s roofing to expand and shrink, so acrylic is well prepared for frequent changes. We service several types of commercial roofing options, such as flat roofs and low slope roofs. 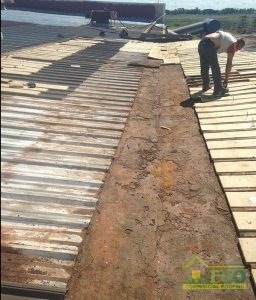 The best way to prevent leaks and ponding is to correctly install the roof in the first place, which our experts can help you with. Our flat roof solutions are meant to outlast the competition, and provide dependable protection for your home. Residential and commercial roof services from ECO Commercial Roofing are dependable and affordable. You can ask for our durable roofing in Lucas, TX, as well as the nearby areas. Investing in a quality roof system for your building will certainly benefit you later on in your business. Give us a call today at (833) 200-0571 with roofing questions, or if you’d like to schedule an appointment with our expert roofers.